DHAKA, Bangladesh (AP) — As Bangladesh reels from the deaths of hundreds of garment workers in a building collapse, the refusal of global retailers to pay for strict nationwide factory inspections is bringing renewed scrutiny to an industry that has profited from a country notorious for its hazardous workplaces and subsistence-level wages. 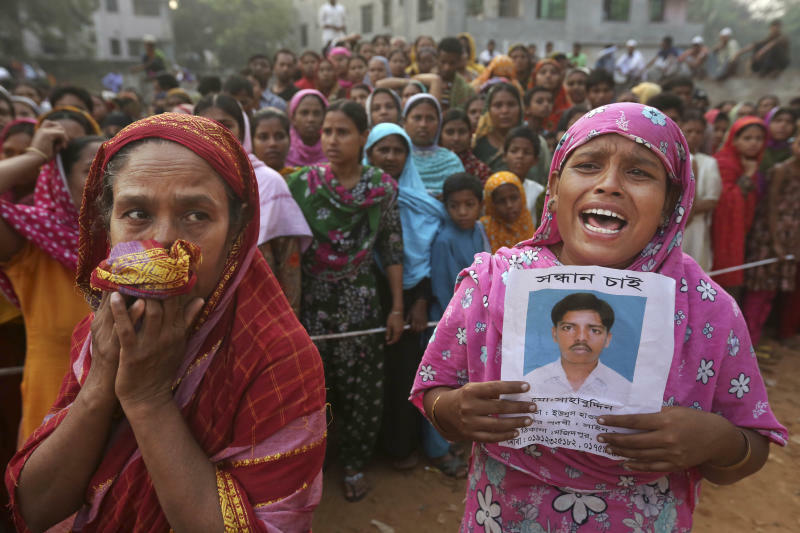 After a factory fire killed 112 garment workers in November, clothing brands and retailers continued to reject a union-sponsored proposal to improve safety throughout Bangladesh's $20 billion garment industry. Instead, companies expanded a patchwork system of private audits and training that labor groups say improves very little in a country where official inspections are lax and factory owners have close relations with the government. In the meantime, threats to workers persist. In the five months since last year's deadly blaze at Tazreen Fashions Ltd., there were 41 other "fire incidents" in Bangladesh factories — ranging from a deadly blaze to smaller fires or sparks that caused employees to panic, according to a labor organization affiliated with the AFL-CIO umbrella group of American unions. Combined, the recent incidents killed nine workers and injured more than 660, some with burns and smoke inhalation and others with injuries from stampedes while fleeing. 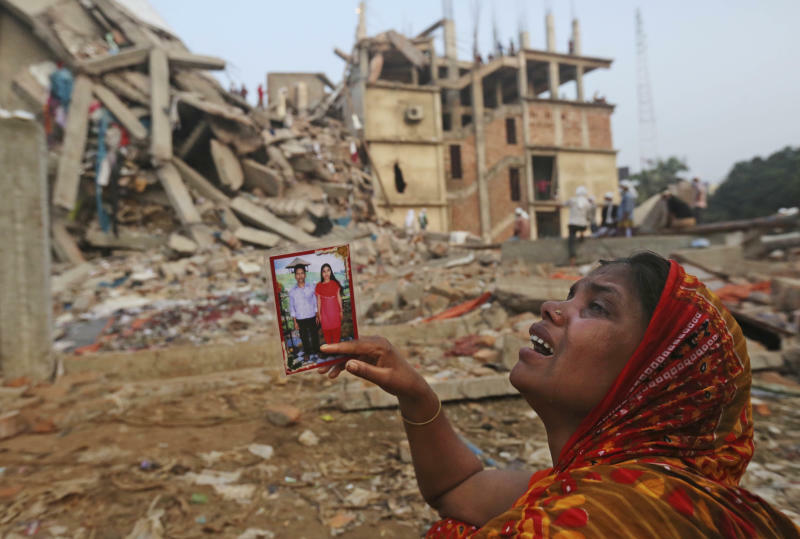 Wednesday's collapse of the Rana Plaza building that killed more than 300 people is the worst disaster to hit Bangladesh's fast-growing and politically powerful garment industry. For those attempting to overhaul conditions for workers who are paid as little as $38 a month, it is a grim reminder that corporate social responsibility programs are failing to deliver on lofty promises. More than 48 hours after the eight-story building collapsed, some garment workers were still trapped alive Friday, pinned beneath tons of mangled metal and concrete. Rescue crews struggled to save them, knowing they probably had just a few hours left to live, as desperate relatives clashed with police. "Improvement is not happening," said Amirul Haque Amin, president of the National Garment Workers Federation in Bangladesh, who said a total of 600 workers have died in factory accidents in the last decade. "The multinational companies claim a lot of things. They claim they have very good policies, they have their own code of conduct, they have their auditing and monitoring system," Amin said. "But yet these things keep happening." What role retailers should play in making working conditions safer at the factories that manufacture their apparel has become a central issue for the $1 trillion global clothing industry. 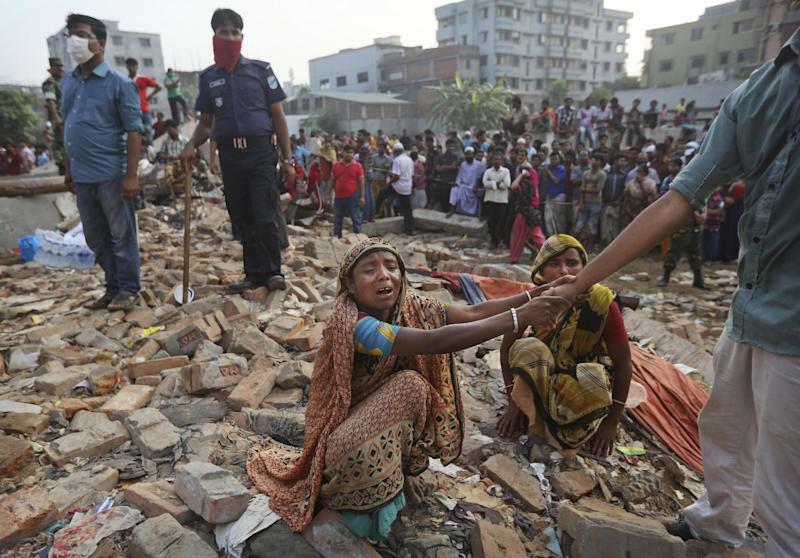 The clothing brands say they are working to improve safety, but the size of the garment industry — some 4,000 factories in Bangladesh alone —means such efforts skim the surface. That opaqueness is further muddied by subcontracting. Retailers can be unwittingly involved with problematic factories when their main suppliers farm out work to others to ensure orders are filled on time. "We remain committed to promoting stronger safety measures in factories and that work continues," Wal-Mart said in a statement after the Rana Plaza collapse. The world's largest retailer says there was no authorized Wal-Mart production in the building. One of the Rana Plaza factories, Ether Tex, listed Wal-Mart as a customer on its website. Labor groups argue the best way to clean up Bangladesh's garment factories already is outlined in a nine-page safety proposal drawn up by Bangladeshi and international unions. The plan would ditch government inspections, which are infrequent and easily subverted by corruption, and establish an independent inspectorate to oversee all factories in Bangladesh, with powers to shut down unsafe facilities as part of a legally binding contract signed by suppliers, customers and unions. The inspections would be funded by contributions from the companies of up to $500,000 per year. The proposal was presented at a 2011 meeting in Dhaka attended by more than a dozen of the world's largest clothing brands and retailers — including Wal-Mart, Gap and Swedish clothing giant H&M — but was rejected by the companies because it would be legally binding and costly. At the time, Wal-Mart's representative told the meeting it was "not financially feasible ... to make such investments," according to minutes of the meeting obtained by The Associated Press. After last year's Tazreen blaze, Bangladeshi union president Amin said he and international labor activists renewed a push for the independent inspectorate plan, but none of the factories or big brands would agree. Siddiqur Rahman, former vice president of the Bangladesh Garment Manufacturers and Exporters Association, denied the factories are responsible for killing the plan, saying the problem was that buyers did not want to pay for it. "We welcome anything that is good for the garment industry and its workers here," Rahman said. He also disputed several union groups' figures of dozens of factory fires since November, saying there had been only one. The Solidarity Center, the non-profit group affiliated with the AFL-CIO, said its staff in Bangladesh compiled the list of 41 "fire incidents" from local media and counted any incident that caused injury or evacuation as an indication of compromised safety. This week, none of the large clothing brands or retailers would comment about the proposal. Wal-Mart spokesman Kevin Gardner did not directly answer questions about the unions' safety plans in replies to questions emailed by The Associated Press. H&M responded to questions with emailed links to corporate social responsibility websites. In December, however, a spokesperson for the Gap — which owns the Gap, Old Navy and Banana Republic chains — said the company turned down the proposal because it did not want to be vulnerable to lawsuits and did not want to pay factories more money to help with safety upgrades. H&M also did not sign on to the proposal because it believes factories and local government in Bangladesh should be taking on the responsibility, Pierre Börjesson, manager of sustainability and social issues, told AP in December. H&M, which places the most apparel orders in Bangladesh and works with more than 200 factories there, is one of about 20 retailers and brands that have banded together to develop training films for garment manufacturers. Wal-Mart last year began requiring regular audits of factories, fire drills and mandated fire safety training for all levels of factory management. It also announced in January it would immediately cut ties with any factory that failed an inspection, instead of giving warnings first as before. And the Gap has hired its own chief fire inspector to oversee factories that produce its clothing in Bangladesh. But many insist such measures are not enough to overhaul an industry that employs 3 million workers. "No matter how much training you have, you can't walk through flames or escape a collapsed building," said Ineke Zeldenrust of the Amsterdam-based Clean Clothes Campaign, which lobbies for garment workers' rights. Private audits also have their failings, she said. Because audits are confidential, even if one company pulls its business from a supplier over safety issues, it won't tell its competitors, who will continue to place orders — allowing the unsafe factory to stay open. The Tazreen factory that burned last year had passed inspections, and two of the factories in the Rana Plaza building had passed the standards of a major European group that does factory inspections in developing countries. The Business Social Compliance Initiative, which represents hundreds of companies, said the factories of Phantom Apparels and New Wave Style had been audited against its code of conduct which it said focuses on labor issues, not building standards. "The audits and inspections are too much focused on checklists," said Saif Khan, who worked for Phillips Van Heusen, the owner of brands Tommy Hilfiger and Calvin Klein, in Bangladesh until 2011 as a factory compliance supervisor. "They touch on broader areas but do not consider the realities on the ground," he said. Johnson reported from Mumbai, India. AP reporter Farid Hossain contributed from Bangladesh. AP Retail Writer Anne D'Innocenzio in New York and AP Business Writer Kelvin Chan in Hong Kong also contributed to this report.